Smoked Sausage Lasagna is the ultimate comfort food. It’s also a nice way to congratulate new parents. Show them you love them with a batch of smoked comfort food, like this smoked sausage and smoked marinara lasagna! Some neighbors of ours recently welcomed their new baby to the world (hi sweetie!!). And knowing all too well what those first few weeks are like, we decided to bring them a dish they can make for dinner on a night they don’t feel like cooking (aka every single day for new parents!). Something simple, yet something perfectly comforting, cheesy, and oozing with smoked love. I mean sausage. Think about it. The love you all have for lasagna just got 100 times more incredible by adding some delicious smoked sausage and rich smoked tomato sauce. Since I was going through the effort of making lasagna in the first place, I figured it was only fair to make a double batch. One for us, and one for them. I’ve made several variations of this over the last week while tweaking the recipe (I’ve been living off of lasagna for 6 days now!! There are worse problems to have I suppose), and for the final recipe below I tried to keep it as simple as possible. You can feel free to customize this smoked sausage lasagna however you would like. 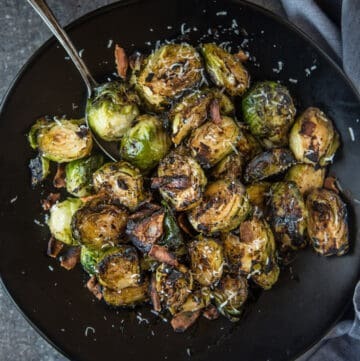 You can add some sautéed mushrooms or other veggies. One of my favorite versions was with spinach. I added about 4 cups of uncooked spinach intermixed with the layers. It kinda made me feel a little bit healthy like I was eating a salad, but one sandwiched in between smoked lasagna love. While the recipe for the smoked marinara sauce isn’t below, I pretty much followed this recipe to a T. The only thing I added was a little tomato paste for more richness. As if lasagna isn’t rich enough! I also threw in some Italian seasonings (dried oregano and basil to be specific). Feel free to adjust the flavors to your preference. Go ahead and smoke the tomatoes and the sausage at the same time. Prep your Italian sausage by breaking it up and placing it on a sheet pan. 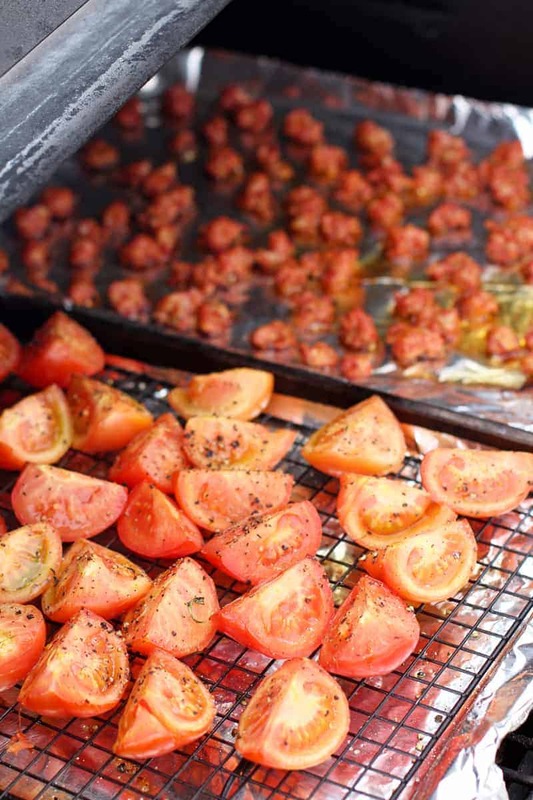 Quarter your tomatoes, toss them with some olive oil, salt and pepper, then place them on a sheet pan. 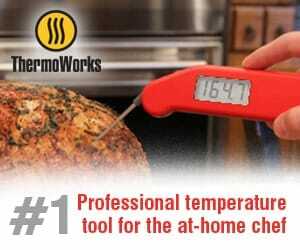 Smoke everything at 250 degrees F for 60-90 minutes, until the sausage reads 165 degrees at its thickest point. Then make your smoked marinara sauce. You might want to make extra sauce, because it’s incredibly easy to just sneak spoonfuls of it and eat it alone like it’s soup. I’m speaking from experience here! Once that’s done, you can build your lasagna. If you are short on time you can make this in batches. The sausage and marinara sauce can be made in advance and stored in the fridge. Even the lasagna itself can be assembled up to a day in advance and placed in the oven when it’s time to eat. 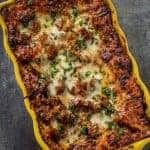 Smoked sausage and smoked marinara sauce lasagna. 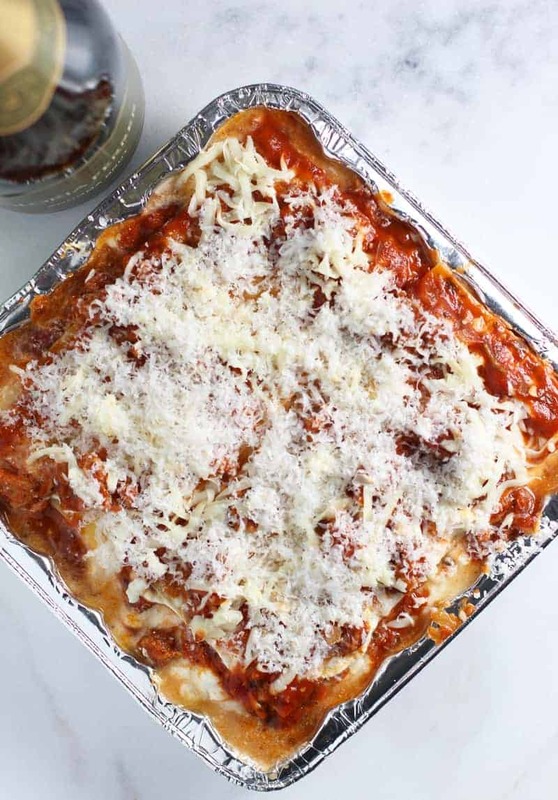 Smoke sausage and combine with smoked marinara sauce for a rich and comforting lasagna dish. 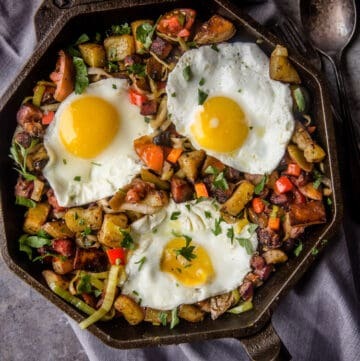 In a large skillet, add 1-tablespoon olive oil and the smoked sausage. Add 4 cups of the smoked tomato marinara sauce and 2 tablespoons of tomato paste. Mix together and let cook 5 minutes to combine. In a medium bowl combine the ricotta, egg, salt, pepper, and nutmeg. Spread ½ cup of the tomato sauce evenly on the bottom of a 9x13 baking dish. Layer with 3 lasagna noodles. Spread 1/3 of the ricotta mixture over the noodles. Add 1/3 of the mozzarella, ¼ cup Parmesan cheese, and 1 cup of the smoked tomato sauce. Repeat with noodles, ricotta mix, cheeses, and sauce 2 more times. Cover with 3 noodles. Sprinkle with remaining mozzarella and sauce. Cover with foil. Bake lasagna, covered with foil, for 40 minutes. Uncover and bake about 15 more minutes, until heated through and liquid is bubbly. Let stand for about 10 minutes before serving. Notes: You can use traditional boiled lasagna noodles too. Works great with either style. No boil are just super easy! One less step. You can add veggies to this too. It works well with sautéed mushrooms or spinach. Just add the veggies to the layers. Wine! For our friends we gave them a bottle of bubbles. Because, new baby. For us, we went for one of my favorite Italian reds — Montefalco Rosso from Umbria. Montefalco Rosso DOC is made with primarily Sangiovese grapes (which are widespread in the area) blended with Sagrantino (the most important grape of the region), to give it structure and character, and often a small amount of Merlot or Cabernet Sauvignon. They are like mini versions of Sagrantino di Montefalco, but great for everyday drinking as well as more affordable. If you’re not sure what exactly the magic of Sagrantino di Montefalco is, please head over here for a little primer. This one from Arnaldo-Caprai never disappoints. This one is rich and aromatic with lots of dark cherry, berries, spice, and some sweet vanilla. It’s got some tannins up in there from the Sagrantino grapes, but it also has some nice acidity that all balance well with the smoky sausage and rich sauce. If you can’t find this wine, reach for your favorite Sangiovese. We also tried it with a Zinfandel (specifically from Seghesio) that worked very well too. It had less acid and tannins than the Montefalco Rosso, but had rich fruit that worked well with the comforting lasagna. Doesn’t that just sound delish?! 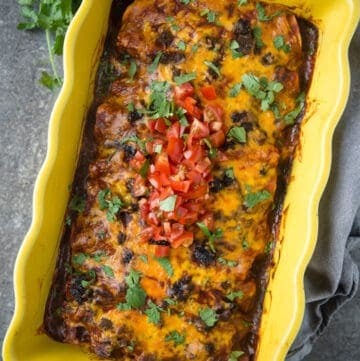 What are your favorite make ahead meals to make for friends? That looks so delicious! Can’t wait to try it!!! Smoked sausage and sauce sounds delicious. This looks absolutely delicious!!! I am definitely going to try this out!! Those tomatoes look AMAZING!!! Thanks!! Thanks! The sauce is so easy! And if you’re smoking the sausage anyways, it takes no extra time to throw on some tomatoes too!! This looks so yummy! And, I love that you offer a wine pairing. That’s an area I want to know about, but tend to always fail. Lucky neighbors! This looks A-MA-ZING! I’ve never tried that Arnaldo-Caprai wine but, based on your description, it seems like my kind of wine! I will need to keep an eye out for it! It’s consistently a good wine, that’s for sure!! I hope you find it! 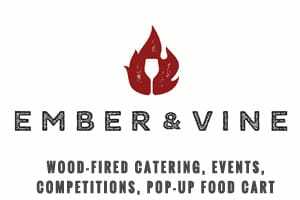 A guaranteed way to make me drool when talking about food is to tell me that the flavouring is smoked… this looks so gorgeous and you’re right – the best way to congratulate new parents! Ha 😉 Smoked food = best food! Yum! I love the process of making lasagna, and am very intrigued by the roasted tomatoes! The tomatoes rock. You can use them for so many things (smoked tomato soup, bloody mary mix, pasta, pizza sauce, etc!). Super versatile. Ha 😉 Thanks so much!! A smoked pasta sauce sounds like an amazing addition to lasagna ! I cant wait to try it. Sounds like such a lovely concept! I love the idea of the smoked flavor in there! Yum! Hahaha… I love that you can actually see from the photos that you test your recipes! 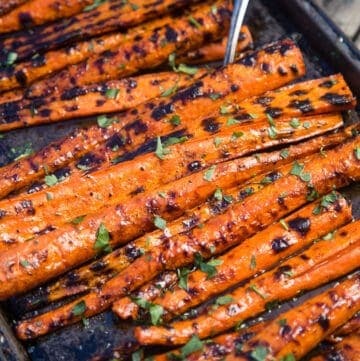 This looks amazing… smoked tomatoes would make the dish for me. YUM. I could certainly live off of lasagna for 6 days, I am a bit like Garfield the cat that way. Oh my gosh, that looks so amazing! 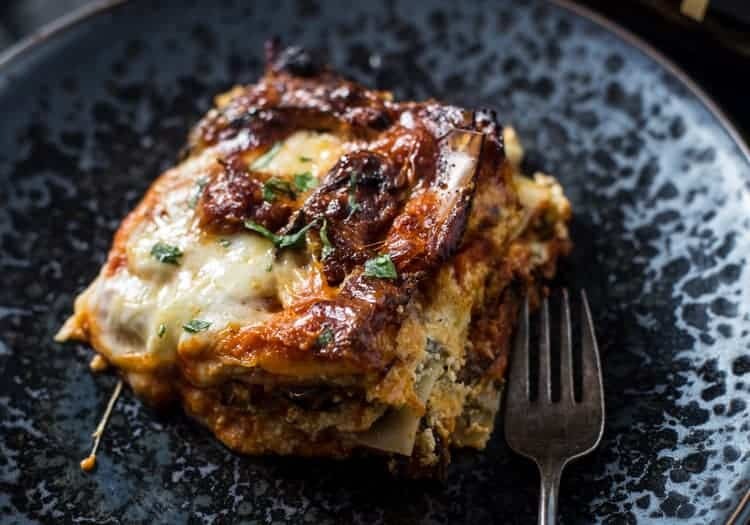 I am such a lasagna lover and this is on my must-do list now! Yummy! Lasagne = greatest comfort food ever! This lasagna looks good enough to eat right now! I can just imagine how good it must taste! Yum! Thanks for the recipe. I’m giving it 5 stars. A few days after I had my son, a friend showed up with quinoa-stuffed acorn squash, a big green salad, and a bottle of red wine. I was so touched–and so starving! I’ll never forget it. This lasagna sounds delish. 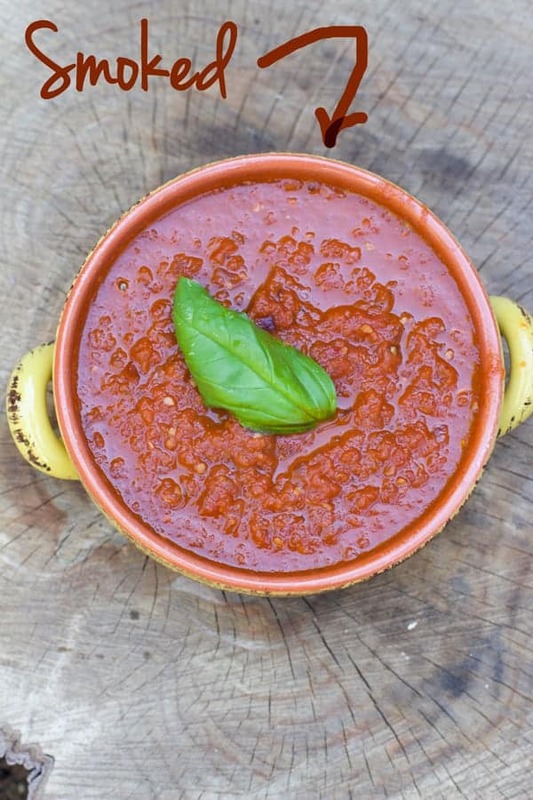 I love the idea of smoked tomato sauce! The same thing happened to us!! We had a friend bring over some amazing and unexpected food for us after the birth of our boys. We were so incredibly grateful and touched that we now do it for any friend near us who has a new baby. I know a lot of parents have a hard time asking for help (I know I did!! ), so we just bring over food no matter what. Beautiful photos! Love the idea of the smoked marinara sauce!! The smoked tomato sauce looks AMAZING – And, leftover lasagna is never a bad thing! This recipe sounds fantastic. Perfect lasagna to have stored away in the freezer or to bring to a friend as a gift. Love the smoke idea so much! 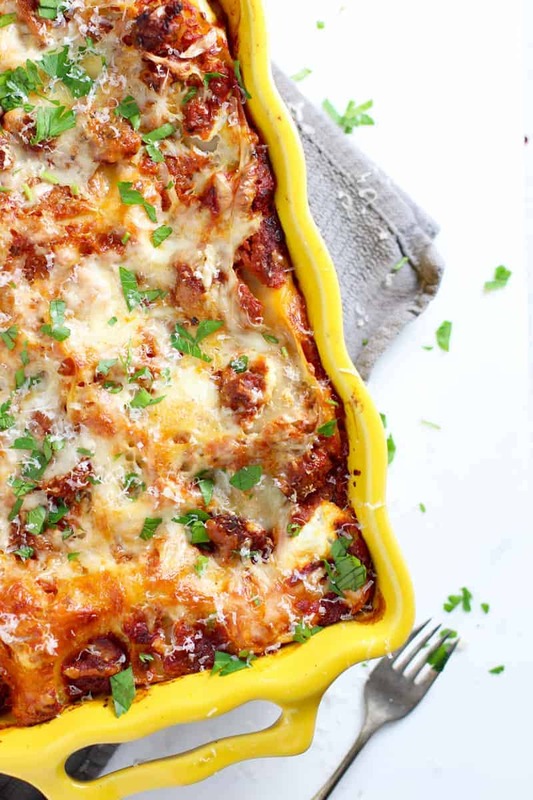 Making lasagna has always intimidated me, but this looks just way too good not to try. What an amazing recipe! I will absolutely risk my dairy intolerance for this dish. I love lasagna! 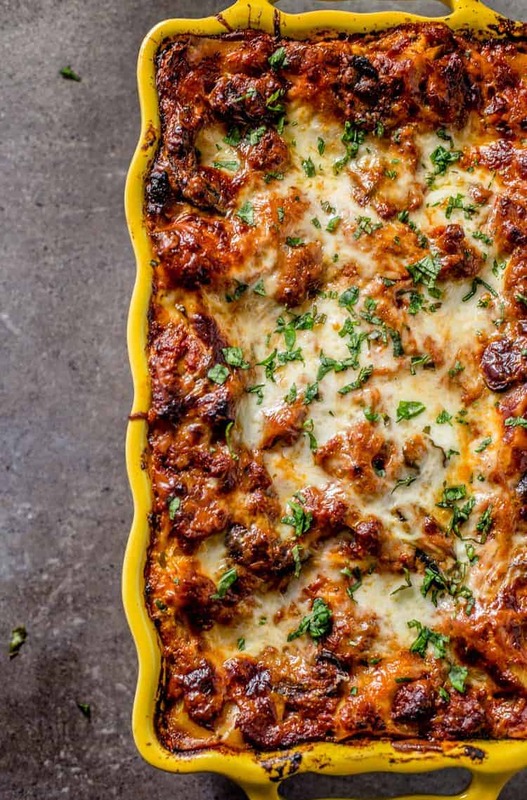 Wow wow – you had me at “lasagna” – I love anything pasta but lasagna is one of my favorites and this looks wonderful! You had me at “smoked”! 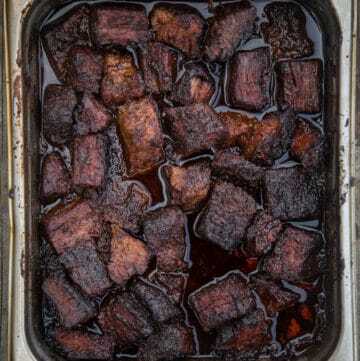 I absolutely love anything that is smoked and your recipe sounds delicious! Yummy infinity squared! =) Your pictures are absolutely gorgeous and inviting. I can almost smell the delicious aromas from the photographs. I have never had wine with Sangiovese grapes. This is going on my list. 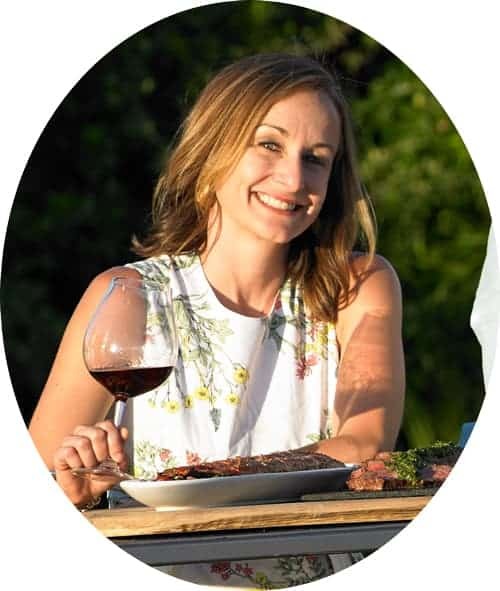 Thanks for all the mouth-watering recipes and wine pairings. Fabulous! Ooh, this looks amazing! 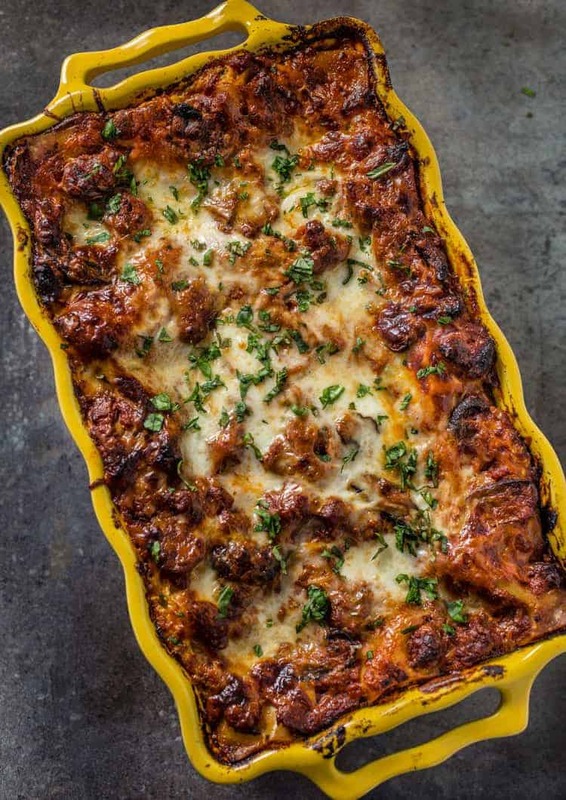 Lasagna is one of my favorite dishes…love that you used smoked sausage too! A must-try! Doooo it! It’s so good!! I have to admit that I have never made a lasagna before. Would love to try this one out for the first time. Oh yes, this would be a great first lasagna!!! It’s a pretty simple and straightforward process after smoking up the sausage! !